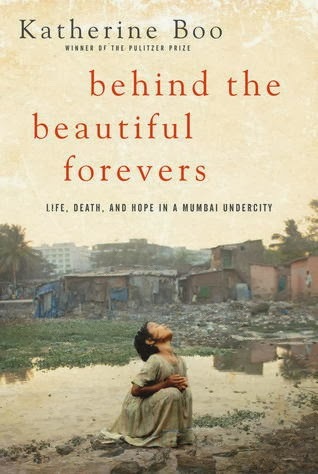 Life in the Mumbai slums, or "undercity", is marked by unspeakable poverty, corruption, filth, hopelessness, and often despair. Katherine Boo spent years documenting the lives of several families in the Annawadi slum and, as you would expect, Behind the Beautiful Forevers is heartbreaking, sobering, and just plain sad. Raising awareness and increasing understanding are necessary first steps toward solving a problem, and Boo's book deftly accomplishes that. Reading about these "invisible" people provides an important alternate perspective, and I see why the book is appearing on reading lists for AP English classes and incoming first year college students. Did I enjoy it? Really good narrative nonfiction is always a treat and Behind the Beautiful Forevers is certainly that, but enjoyment doesn't figure into this experience. It's an important, but ultimately depressing book. Should you read it? Probably, but be prepared. "As India began to prosper, old ideas about accepting the life assigned by one's caste or one's divinities were yielding to a belief in earthly reinvention. Annawadians now spoke of better lives casually, as if fortune were a cousin arriving on Sunday, as if the future would look nothing like the past." In an attempt to finish in time for book club, I downloaded the audio and listened on my walks. This was the first time I've encountered Sunil Malhotra and, while he did a perfectly adequate job narrating, it did not add anything to my overall experience. So, read or listen according to your own preferences. I find books like that engrossing but they do make me angry. I do think they're important though. Thanks for your review. This is an attractive book, but I'm not sure if I would like to read such a sad story. Pat - This is definitely not for everyone. I read this one too. It was so sad. It just broke my heart. Melissa - My book club went to hear the author speak at a nearby university. She was able to give us updates on several of the families... so interesting. Definitely need to add this to THE LIST. Andi - This was part of my latest nonfiction batch of books... thinking I may continue nf reading a little longer. That is kind of how I felt about Fire in the Ashes, an audio I read awhile back about kids growing up in poverty in NYC. Some happy stories, some not. But these are important books. They make us more aware of situations outside our comfy homes. I need to read more of these books. Sandy - These books are really great for broadening our perspectives, and I think that makes them important choices for book clubs and discussion groups. None of us liked reading the book, but we're all glad we did. Yes, it must be difficult to say you outright enjoyed this book.Though at the same time books in that vein are those that stay with us longer. It sounds a sad story but a very important read. Charlie - This book was fascinating and showed a way of life my friends and I could never even imagine living. Certainly not enjoyable in the traditional sense, but you're right... it will stay with me for a long time. No way could I read this now. I need lots of uplifting these days. Stacy - You need to forget about this book for now!! This must have been very difficult to listen to but worthwhile. LindyLou Mac - It really was a difficult book, but I'm so glad to have read/listened to it. My nephew just finished reading it for his AP class, so I'm anxious to hear what he thought. I've been wanting to read this one for some time but knowing that it's going to be a depressing read, I keep putting it off. It does need to be read. I tried to listen to the audio, but couldn't get interested. Could have been a timing issue, but maybe it's one I should just read (in print). However, I'm not sure I'm up for something sad and depressing right now. Like Stacy, I need uplifting reads. Les - It's not a book I can readily recommend, but it seems to have an impact on most readers. The audio didn't do much for me either. I was already invested in print before listening so that helped. Would skip it completely of you're looking for uplifting. Definitely need to consider this one to be added to the list! Melinda - It's a difficult read emotionally, but an important one.